Russ Michael Review of Something's Coming! Upon, during and after reading this truly ponderous, noticeably over-size, 440 page, ultra-thrilling "SOMETHING's COMING--Universal Cities of Light---Love and Healing"---book by Genii Townsend, I quickly understood 'why' the published much smaller introductory best-seller book edition, "City of Light Sedona," by Genii Townsend has "sold in 18 countries." "Dear Charles, my beloved spiritual "World Server" brother - what a ponderous, nicely layed-out, wide range of ultra-interesting spiritual subjects. I also see a brief "Structured Water" chapter in it. Good choice. Congratulations! On doing such a terrific book "publishing house" job. As I read further and further into this colossal book, it was crystal clear why this timely huge sequel..."SOMETHING's COMING--Universal Cities of Light---Love and Healing"---book by Genii Townsend is predicted by the Universal City of Light Sedona Heavenly Federation of Light host "OOO-LON" and other attending Divine Beings---capable of peering into Earth's past, present and future Third-Dimensional and Fourth-Dimensional timelines, assure Genii Townsend our so greatly loved 'destined scribe' to follow up with this massive light-filled sequel---publishing all of her 135 visits into the "City of Light Sedona," the first of 14 Universal Cities of Light, of love and healing centers that will will be placed in strategic planetary locations, easily available to all members of our One Human Family on Earth. I too am certain this will be be the "most read book" in the entire history of all books ever before written, now written, or will be written . . . of all past, present and future life books written and read in the entire time-line third-Dimensional and fourth-Dimensional spectrum of the existence of all sentient life on our lovely Planet Earth...as "head honcho" OOO-LON repeatedly assured Genii. "Several days ago I received one of the best "book gifts" of my life, a ponderously huge 440 page book in more ways than size---length, width, breadth and weight---titled, "SOMETHING COMING! Universal Cities of Light---Love and Healing! - GENII TOWNSEND and ever since, I could not wait to take time out of my already high priority, first things first list of daily commitments to sit in the silence and excitedly read 40 or more book pages at a sitting. After I have finished this colossal light-filled book, for I am thrilled, uplifted and enlightened---by what I have read and be assured, I will certainly be writing a rave book review of it ASAP. OOO---LON, the "Head Master" in the now "actualized" holographic City of Light Sedona within where Genii Townsend has been visiting for years for progress updates, states their will be no other City of Light book written and published---prior to the actual physical manifestation of the City of Light Sedona---and copies of these books will be precious "collectors items", for this book will go down in history to be the most read book, the most significant book written and read in the entire past and future history of our planet Earth. I am certain most, if not all readers of this 440 page volume will greatly appreciate both the 'over-size' book publication---a good third or more size' larger than most published books---but also the thick sturdy pages and extra-large size print, making the entire volume . . . a fast, easy read . . . as most will probably want to re-read it all, or at least some parts to make sure they have not missed perhaps an even greater understanding of the divine message imparted here to each and all of us so fortunate to be humanly embodied on Earth during our final Golden Age on Earth. Genii Townsend and her soulmate husband, Rev. William Townsend, a Pastor of a Religious Science Church in California were Divinely led---approximately 30 years ago, for William Townsend---to telepathically receive and draw the initial huge City of Light healing center blueprints of what is now an already very huge, Divine, perfectly completed City of Light Sedona . . . now fully constructed, already Divinely Staffed, down-to-Earth, etheric, physically anchored---non-visible for now---in the outskirts of the city of Sedona, Arizona, U.S.A., as of etheric physical manifestation date of Christmas Eve, of our Christmas 2012. We are assured this City of Light Sedona will be a sudden, visibily seen, physical walk-in Divine Healing Center of Light and Love, reported by an immensely shocked worldwide major public media sources, hailed rightly so, as explained to Genii during her now published visits into the City of Light Sedona, where she received answers face-top-face from her Heavenly 'Federation of Light' Guides. When first presented as a Divine Mission to Genii and Rev.William Townsend, both were instructed to keep this Divine project an absolute secret---shared only between the two of them until instructed "when to go public"---as revealed in this volume, and in the now published earlier preview publication, the City of Light Sedona. I took notes as I read and 'noted and marked' 29 different pages "speaking to" President Obama's vital role in the Cities of Light Sedona physical manifestation and our imminent forthcoming Golden Age on Earth. 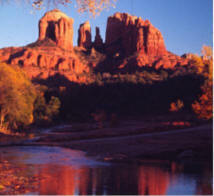 Several of Genii's profound "enlightenment" visits and pages speak to the City of Light Sedona, considered to be "the Second Coming" of the Christ. Almost every page read adds insight as to why these Universal Cities of Light will soon all be physically present at walk-in physical entrance levels. I resonate with all that is disclosed---for since and after my death experience at age 18, I have known that our Earth Humanity will enter a Golden Age, and all of us---fortunate to be humanly embodied on Earth during these awesome 'end times'---would keep ascending spiritually, eventually all becoming conscious Masters of Light, Wisdom and Power, without experiencing a physcial body death, as former Ascended Masters like Jesus, St. Germain, and many recorded hundreds of thousands of "Rainbow Body" ascendants in Tibet and India needed "physical body disintegration and death" to utilize as a 'portal entrance' to Higher Spiritual Dimensional levels, as David Wilcock (former Edgar Cayce, now humanly re-embodied as world known Lightworker David Wilcock revealed in his latest blockbuster bestseller book, "The Source Field Investigation." For decades now, I have done what I love and I love what I do, and that has kept me in robust good health, no aches or pains, I work 12 hours daily, and I feel like age 20 . when my body has been on Earth more than 8.5 decades Doing what I love and loving what I do is my daily reward, but I was delighted to see references on many pages to dear known worldwide Lightworkers I know and honor highly, like Michael Quinsey, telepath for SaLuSa, a key spokes person for the Galactic Federation of Light, Suzanne Ward, telepath for "MATHEW" and her several insightful "Matthew books" - Blossom Goodchild, telepath for the Federation of Light, and long time active Lightworkers like Nancy Tate, or 'The Coming of the Cities of Light by Steve Beckow---Page 418. contributing a collection of his insights compiled as a Chapter in this book. Please note my definition of a "Lightworker," is a pure innocent new-born babe, a woman or man of good will, or a child of good will, for each and all of these are innately and naturally "a Light worker on Earth" and we are all here on Earth to shine our light and love into an otherwise dark world of the dark planetary past as our New Age of Light now manifests on a well-Lighted New Earth. Sharing the light and love we own within our own Light Beings and widely, lovingly, thoughtfully, sharing good light-filled books such as IS this "SOMETHING's COMING--Universal Cities of Light---Love and Healing"---book by Genii Townsend . . . .speeds forth the physical ground level "walk in" appearance and high, wide OPEN GATES of these forthcoming 14 "Universal Cities of Light" and Humanity's healthful, overflowing abundance, harmony, peace, good-will and triumphant joy of our individual and collective final Golden Age on Earth immensely. Read about (all of us who choose) "Reversing Age" on Page 367---and "No one can remain ill"---on Page 368. All is well. Bless us all. Be ever in Well-Being. ENJOY.... and SHARE... the treasures of life. WE are ONE in the ONENESS of All That Is.